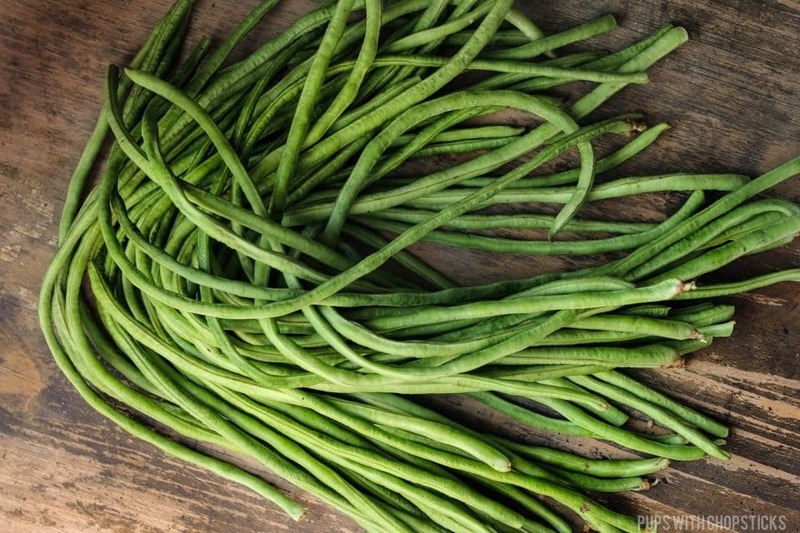 Yardlong beans (aka Chinese long beans) are thin, long beans mainly used Asian, Indian and Caribbean cuisines. They are most commonly used in stir fries, curries or eaten raw. They are most commonly used in stir fries but are also used a lot in curries because it has a tougher exterior and can hold its shape better than a typical green bean. When you are preparing these, cut off and discard the ends and then chop them up into smaller sizes so they are easier to cook and eat. You will find yardlong beans in most Asian grocery stores. Although I have been able to occasionally find it at my local grocery store as well. When buying these, make sure they are green, dry and firm. These are susceptible to mold if they are packaged, so watch out for brown patches or white slimy spots. If you can’t find these easily, you can substitute this with green beans. The only difference is the green beans will not need to be cooked for as long as they tend to get softer more quickly. These beans do not have the traditional texture of regular green beans, although they can be used interchangeably. Yardlong beans have a slightly tougher exterior to it. When eaten raw, it can have a bit of of a tougher chew than a standard green bean. Although it is crunchy when raw, it doesn’t have the same crispness as a typical green bean. Generally, these tougher beans take a bit longer to cook than its counterpart which is why it is great in curries – because it can hold up its shape well.